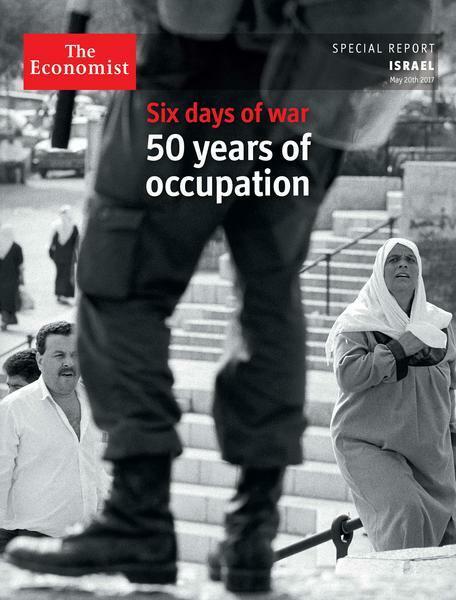 Economist explains 50 years of occupation. Obfuscates 50 years of bad Palestinian decisions. One of the Economist’s featured articles in their special report on the anniversary of the 1967 war (‘Six Days of War, 50 Years of Occupation’) putatively focuses on Israel’s stunning economic achievements, but ultimately pivots to a more predictable tale of exploitation and inequality. Israel attracts about 15% of the world’s venture-capital investment in cyber-security. It is part of Israel’s booming “startup-nation” economy, the most dynamic innovation ecosystem outside America….Other high-tech areas look promising, too, among them agricultural and water technology (building on Israel’s expertise in desert farming), digital health services and financial technology. The biggest buzz is over driverless cars. Boosters think that Israel can help produce their brains—computer vision, lidar (laser scanning), artificial intelligence and cyber-security—leaving the engines and the metal-bashing to others. Intel, a giant maker of computer chips, has recently bought Mobileye, which makes driver-assistance systems, for $15.3bn. All this marks a remarkable change from the 1980s, when Israel was on the brink of financial collapse. Its near-defeat in the Yom Kippur war had caused it to push defence spending to an extraordinary 30% of GDP in 1975. By 1984 public debt had reached nearly 300% of GDP and hyperinflation peaked at 450% a year. Israel has not had a recession…since the height of the second intifada. Well, for starters, the total annual Israeli budget for 2016 was 424.8 billion shekels. The government spends (according the Finance Ministry, as reported by Globes) about 1 billion shekels per year on the settlements. Total government funding for yeshivot is 1.2 billion shekels. To put the expenditures on settlements (1 billion) and yeshivot (1.2 billion) in better perspective, on education alone in 2016, Israel spent 52.2 billion shekels. So, whilst it is true that Israel’s investment in education and infrastructure are low (as a percentage of GDP) compared to other OECD countries, the figures cited above raise serious questions about the claim that under-investment in these sectors are a result of high spending on settlements and yeshivot. The Economist then correctly notes some of the factors behind the high cost of living in Israel, before introducing their concluding topic, what they refer to as “Occupation Economics”. The economic disparities are striking. With GDP per person at $35,700 a year in 2015, Israel’s standard of living is much the same as France’s. For the West Bank the figure stands at $3,700, akin to Egypt’s; for Gaza it is about $1,700, similar to Congo-Brazzaville’s. In real terms, Gazans are about 25% poorer today than they were at the time of the Oslo accords. Israel’s security barrier is, to a large extent, also a one-way protectionist barrier. The Palestinian market is fully exposed to Israeli goods, but Palestinian products struggle to get out. Strawberry farmers in Gaza, working less than a kilometre from the border fence, say they cannot export to Israel and only rarely to the West Bank. In the main, Palestinians are treated as a source of cheap, and disposable, labour. “We have no economic policy. Everything is tied to the political situation,” says Mohammad Shtayyeh, president of the Palestinian Economic Council for Development & Reconstruction, which co-ordinates aid from donors. The Palestinian economy depends on the earnings of workers in Israel and the settlements, customs remittances from Israel and donations from the West and the Arab world. All these are subject to sharp fluctuations over which Palestinians have little control. The last words of the final sentence (“Palestinians have little control”) not only sums up the Economist argument on the specific topic of Palestinian economic performance, but also arguably represents the broader assumption by which their series is based. Their claim concerning the putatively injurious economic impact of the Israeli security barrier suggests that Palestinians had “little control” over the suicide bombing campaign in the early 2000s which necessitated its construction. It’s as if the Economist sees no connection between economic disparities between Israel and its Palestinian neighbors and the choices Palestinians make – in the case of Hamas run Gaza, to prioritize weapons and other instruments of war (reportedly $100 million a year, representing up to 20% of their total budget) to attack Israel over investment in jobs, education and civilian infrastructure. The situation in the Palestinian Authority is more complex. The Economist’s claim that “Palestinian products struggle to get out” is not supported by the facts. In fact, Palestinian sales to Israel have accounted for more than three-quarters of total Palestinian exports (based on 2012 figures from The Bank of Israel). However, to the degree that their economy is stifled, Economist editors fail to take into consideration the $138 million each year the PA reportedly spends on salaries to terrorists and their families – representing up to 10% of the government’s annual budget. We can only hope that Economist editors will one day engage in a similar degree of self-reflection on their coverage of the region, and begin to critically scrutinize Palestinians with a rigor that’s currently almost entirely reserved for Israelis. Could we please turn it 180 degrees? Stop wining, stop the suffocating corruption and start working for a living. Israel’s economic fortunes are more like France and the Pals’ economic fortunes are more like…other Arabs. Surprise. Nothing to do with their cultural or political imperatives. Must be all Israel’s fault. Surprise again. Just another ignorant cageliner and sewer of ideology-driven bigotry. Been like that for a long time now.